These beautiful holy cards feature the same image that is on the cover of our most recent edition of St. Louis de Montfort's master work True Devotion to the Blessed Virgin Mary. Dos Sacerdotes Montfortianos, Padre Jorge Enrique Gonzales, SMM, y Padre Hugh Gillespie, SMM, nos ayudan a descubrir la belleza y el sentido del Rosario. 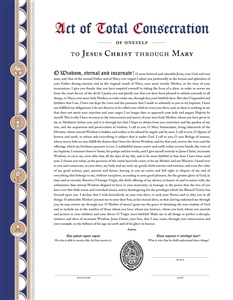 After making your Total Consecration to Jesus through Mary memorialize it with this beautiful 11x14 color print with Marian symbols ready for framing. Available in English and Spanish.